Are You Getting Enough Calcium to Get Pregnant? Home → Egg Health → Are You Getting Enough Calcium to Get Pregnant? You may think you are getting enough of this bone-building nutrient, but is your body actually absorbing it? Calcium is famous for strong bones and healthy teeth, but did you also know it is essential for getting pregnant? Two different studies have shown calcium’s role in conception. One study shows that calcium is a vital ingredient in the process of triggering growth in embryos. The more calcium in the surrounding fluid, the better. The second study focused on what triggers sperm to abruptly convert their swimming style from a slow and steady swim of side to side motion, to a whip-cracking snap that thrusts them into the egg! What they found was that when the sperm arrived in the alkaline environment of the reproductive tract; it triggers the tails whip-like motion. Minerals (calcium being one of the most important) help to create an alkaline environment in the reproductive tract, the nutrient that sperm soaks up, which creates the thrusting towards the egg is calcium. Long study short, calcium is necessary for conception, a healthy reproductive system, healthy baby, and birth. Have you ever heard of the old saying “one tooth for each baby”? I first heard this saying from a friend of mine that was showing me the tooth she lost during her pregnancy. The theory is this- when you get pregnant the baby gets first dibs on everything in your system, calcium included. women who are not getting enough calcium have their calcium leached from them and bad teeth is the outcome. No studies to prove that one but something to think about! Raw milk – 1 quart has 900mg of food-based calcium in it. 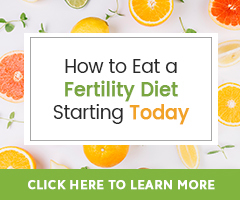 If you are following a Nutrient-Dense Fertility Diet, you are getting your 1000mg of calcium a day. Cream of broccoli soup– 821mg calcium – Make your own at home with organic ingredients. Spinach– What about spinach you ask…? One cup of cooked spinach contains 100mg, although only five per cent of this may be absorbed. This is due to the high concentration of oxalates, a compound in spinach that reduces calcium absorption. By contrast, one cup of cooked broccoli contains about 45mg of calcium, but the absorption from broccoli is much higher at around 50-60 per cent. Other foods rich in calcium: sesame seeds, turnip greens, bok choy, kale, blackstrap molasses, and white beans. P.S. Do not take Tums as your calcium supplement. It is not a good quality source of calcium. It is hard to assimilate and absorb calcium from this source. Coffee– If you drink more than 2 cups of coffee or caffeinated tea, or more than two sodas, increase your daily intake of calcium an extra 200-300mg. Oxalates and Phytates in Veggies – Due to the low absorption of calcium from veggies due to the naturally occurring oxalates and phytates, take an extra 300mg a day of calcium. Salt– If you consume more than 2,400mg of sodium a day, get yourself an extra 100mg of calcium per 1000mg of sodium above 2400mg. Vitamin D– Get 15 minutes of sunlight a day. Magnesium– get around 420mg a day with your calcium. If you are eating the food sources above or using the calcium supplements, I recommended there is no need to supplement additional mag. Prebiotics– The food for probiotics has been shown in studies to improve calcium absorption by 20% and significantly improve bone mineralization. FOS powder can be sprinkled in foods or beverages; it has no taste and dissolves easily. It is in general good to get nutrients from a variety of whole food sources. Your initial priority in pregnant how to get pregnant needs to be to seek the recommendation of with your doctor. Your physician will be capable to tell you what alterations you want to make to your overall health to aid in pre-conception planning. What’s more, each partners ought to seek the recommendation of their respective medical doctors with reference to any medications that could obstruct fertility and/or may enhance the possibility of a miscarriage once pregnant. Thank you for sharing your thoughts and opinions! While we do agree that it is important to work closely with your doctor in pregnancy if you have one (or have a concern about calcium levels), many do not work with medical doctors. Many women choose to work with natural healthcare practitioners like herbalists, doulas and midwives only. We provide the information we do in this article as but one educational piece for those concerned about their calcium levels. Naturally supporting calcium levels through eating calcium-rich foods and supplementing calcium is one safe, easy way to do this.